S Kant, S Sharma, S Verma, R Singh. Isolated Tubercular Osteomyelitis Of The Mandible. The Internet Journal of Orthopedic Surgery. 2007 Volume 9 Number 2. Tubercular osteomyelitis of the mandible is a relatively uncommon clinical entity. Hereby we are reporting such type of case in an eight year old female, presented with multiple pus discharging sinuses over right mandible for two months and responded well to antitubercular treatment. Tuberculosis of the mandible is considered a rare disease1,2. 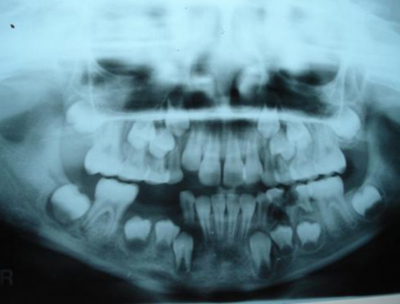 Tubercular osteomylitis of the mandible found to be more among children than adults. Tuberculosis in the oral and maxillofacial region is five times more prevalent in males than females. However isolated tuberculosis of mandible in the absence of active pulmonary tuberculosis is an uncommon clinical entity. An 8 year old female, patient was referred from the department of orthodontics to our department with complaints of pain and pus discharging sinuses over body of the right mandible for two months. He took antibiotics and other supportive treatment for two month without any clinical improvement. There was no past history of trauma, antitubercular treatment and family history of tuberculosis and no history of any dental or oral cavity problem. The patient was of an average built and moderately nourished. Local examination reveals a swelling over the angle of the right mandible and there were two pus discharging sinus, one at angle of the mandible and another at body of the right mandible bone. Margins of the sinus were hyperemic with undermined edges. Examination of the oral cavity was normal. There was no significant peripheral lymphadenopathy. The examination of the chest was normal . PPD was positive with indurations of 18 × 20 mm. OPG was done that revealed a multiple radiolucent area in the angle of the right mandibular bone region suggestive of tubercular involvement and bony architecture in the remaining part of the mandible was normal (Figure : 1 ). Figure 1 : OPG revealed a multiple radiolucent area in the angle of right mandibular bone region suggestive of tubercular involvement and bony architecture in the remaining part of the mandible was normal. Aspiration of material from the lesion was also done and revealed acid fast bacilli. Her cytological examination was positive for Mycobacterium tuberculosis through Bactec culture method. Culture examination for pyogenic bacteria did not grow any organisms. Thus the diagnosis of mandible bone tuberculosis was made and her treatment was plannedwith with three drugs (Rifampicin, Isoniazid and Pyrazinamide) for 2 months, followed by 2 drugs (Rifampicin, Isoniazid) for 4 months, as per WHO Guideline. After two months of therapy she improved markedly with gross reduction in the swelling and healing of the discharging sinuses. She is under regular follow up and has shown no signs of recurrence. Involvement of bone occurs in 1 to 3% of patients with Extrapulmonary tuberculosis and spine represents 50% of these lesions3,4. Tuberculosis of the mandible is considered a rare disease. Tuberculosis of the mandible apparently affects both sexes, with male preponderance. According to Chapotel, more than 60 percent of mandible bone tuberculosis was seen in patients less than fifteen years of age2 but it can present in old age also. Manish Kohli et al reported two cases of tubercular osteomyelitis of mandible bone, in 18 year and 53 year old patients. Fakuda et al reported a case of primary tubercular osteomylitis in a 76 year old female5. The age of our patient was eight years. Direct transfer from infected sputum2 or infected raw milk of cow7 through (a) an open pulp in carious tooth (b) an extraction wound or (c) gingival margin or perforation of an erupting tooth. Regional extension of soft tissue lesion to involve the underlying bone1. Radiological features of mandible bone tuberculosis appears as blurring of trabecular details with irregular areas of radiolucency. There is erosion of the cortex with little tendency to repair. Gradually the bone is replaced by soft tuberculous granulation tissue. Caseation appears at places followed by softening and liquefaction. A sub- periosteal abscess then forms presenting as a painless, soft swelling. This cold abscess may burst either intra or extra orally forming single or multiple sinuses. Pathological fracture of mandible and sequestration may also occur9. The diagnosis of a case of tuberculosis of mandible is extremely difficult10 as no specific sign is pathognomic of infection11. The only manifestation may be a localized swelling of the jaw and it may be misdiagnosed as a pyogenic abscess or if sinuses are present, may be confused with actinomycosis. The diagnosis must be established by histological examination of tissue or demonstration of the organisms in the lesion (as in present case). The patient responds well to anti-tuberculosis regimen. Treatment includes standard antituberculosis drugs for six months or category-III under Revised National Tuberculosis Control Programme as per as WHO Guideline for management of tuberculosis12. But in other study treatment of osseous tuberculosis include a 2-month initial phase of isoniazid, rifampin, pyrazinamide, and ethambutol followed by a 6- to 12-month regimen of isoniazid and rifampin13. There are few studies argue that the paucibacillary nature of the lesion make a 6-month treatment course appropriate 3. Although of rare occurrence, the differential diagnosis of tubercular osteomyelitis must always be kept in mind by clinicians, when routine therapy fails to bring about an improvement in the lesions of mandible. However, if the lesion is primary and detected early, the disease is completely curable and can lead to reversal of all destructive bony changes. Chinese. Chinese Med. J., 1934; 32: 637. 2. CHAPOTEL: Tuberculose mandibulaire. Rev. Odont. 1930; 14: 444. 3. Sante LR: Principles of Roentgenologic Interpretation, 11th ed, pp 109. Ann Arbor MI, Edwards Bros., 1958. 5. Fakuda J, Shingo Y, Mikayo H. Primary tuberculous osteomyelitis of the mandible. A case report .Oral Med Oral Pathol ,1992; 73(3): 278-280. 6. Thomas KH. Oral Pathology. In: Kimpton H, editor. A textbook of oral pathology. 3rded. Philadelphia: WB Saunders Company; 1950:891-895. 7. Schmuziger P. Primary tuberculosis of buccal mucosa. Rev Mans Suisse Odont 1945; 60: 1087-1088. 8. Ratliff DP. Tuberculosis of the mandible. B Dent J 1973; 135: 122-123. 10. Darlington CC, Salman I. Oral Tuberculous Lesions. Am Rev Tuberc 1937; 35: 147-149. 11. Tanchester D, Sarin S. Dental lesions in relation to Pulmonary Tuberculosis. J Dent Res 1937; 16: 69-70. 12. World health organization .Treatment of tuberculosis; Guidelines for national programme. WHO/CDS/TB, 2003; 313.